Heaven and Earth aligned on October 29, 2012 turning Hurricane Sandy into a devastating "superstorm." Magnified by the full Moon at 6 Taurus 47, Sandy hit head-on the areas of Long Island, Manhattan, and Atlantic City, New Jersey, decimating the shoreline. It will cost billions of dollars in damages, setting records for the most costly and deadly – the worst ever experienced in the area. There was nothing they could do to protect from the surf. When the Moon waxes to its full phase high tides rise higher than normal, and when hurricane winds push the water surface above normal levels storm surges occur. The last time this combination of atmospheric conditions occurred in the Mid-Atlantic, was during the “Ash Wednesday Storm” in March 1962. The coastal impact from North Carolina to New York killed 40, injured over 1,000, and cost millions in property damage. A full Moon occurs when in opposition to the Sun, and the Earth is aligned between them. In astrological terms, the full Moon represents tension, being pulled in two different directions, confrontation, separation, breakdown, and competition requiring cooperation and compromise. Feelings and emotions run high and sleep deprivation may occur. It is time to reassess the past before going forward, but Individual effects and circumstances are revealed by the house position, signs, planets, and aspects in the birth chart. Finding the precise birth time of a city is a daunting task. Therefore, using LMT (local mean time) as a guideline, which automatically places the Sun near the Midheaven, has been a logical and efficient astrological tradition. Some birthdates for cities not always agree because some of them pertain to specific events. Choosing the earliest known city charter or incorporation as the founding date has proven the most accurate. Thus, when using LMT attention should be focused on signs and planetary aspects rather than houses. 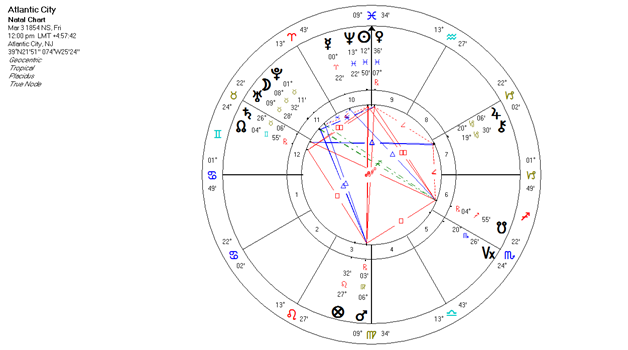 MANHATTAN ISLAND NATAL CHART- February 12, 1653: This chart represents the first distinctly municipal form of government when Dutch colonists named the settlement New Amsterdam. In 1664, the British captured it and renamed it New York. Many different cultures fought many bloody battles for ownership of the island. The easy access to foreign ships contributed to become the ideal entrance into the new world where people hoped to get established and start a new life. This chart clearly reflects the difficult circumstances taking place at the time, which naturally hold true to this date (anything born at any time has the qualities of that moment and time for ever). “The city that never sleeps” was born on a full Moon, proud and self-determined foreigners, and natives, all striving for independence, freedom, and autonomy (Moon in Leo, trine Uranus in Sagittarius, Mercury-Jupiter in Aquarius, opposite Saturn in Leo); strong resiliency in the struggle for survival (Mars in Scorpio on a separating square to Sun-Moon opposition), and the fulfillment of personal desires and ambitions (Mars sextile Venus in Capricorn). Pluto, as a singleton planet (alone in one side of the chart with all other planets at the other side) is the focus point for the rest of the energies in the chart. The sextile to Saturn suggest long-time goals are of prime importance. This is representative of a community of doers “taking care of business” in a constant state of regeneration. 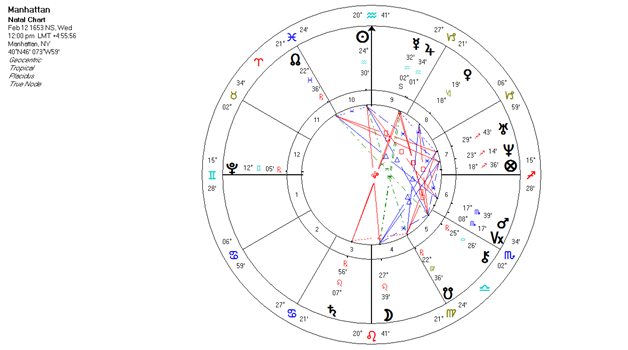 The best way to ascertain the accuracy of a birth chart is through the application of significant or extraordinary events, such as the terrorist attack of September 11, 2001, in addition to hurricane Sandy. I can only include here the most significant aspects activating the Manhattan chart during these events. On September 11, 2001, transiting Uranus was conjunct the exact conjunction of progressed Jupiter to natal Sun, in opposition to progressed Saturn (sudden challenge from a foreign source destabilizing basic identity and structure); transiting Neptune conjunct progressed Sun (victimization, confusion, loss, defeat, depression); transiting Saturn conjunct natal Pluto while transiting Pluto makes its opposition to natal Pluto (forced transformation through hardship and destruction). The full Moon with Sun-Saturn conjunction, forms a Grand-square with natal Mercury-Jupiter, and natal Saturn (devastating forces, restriction, limitation, challenge to the struggle for growth and improvement); progressed Saturn in exact opposition to natal Sun (challenge to persevere through hardship); progressed Jupiter opposition natal Moon (costly blow to basic security); transiting Mars-Jupiter opposition, triggering the natal focus point Pluto, is an indication that faith and confidence is needed to let go of the past and take action toward the future. (Weather delineations are not included). The Venus-Sun-Neptune in Pisces makes this city the ideal seaside resort. It is perfectly suited for drifters, dreamers, and schemers, as well as music and entertainment. It attracts people in search of pleasure and leisure. Many disappointments, disillusions, and anger may result when having to choose between delusion and reality (opposition from Mars in Virgo). Building, expansion, and exchange of money (jobs, gambling), is the name of the game (Pluto-Moon-Uranus conjunction in Taurus, trine Mars). Saturn, also in the money sign of Taurus, trine Jupiter in the business sign of Capricorn, is a significant indication of enterprising success, support for legislators and big business tycoons, and a well organized industry. “Boardwalk Empire” comes to mind. This full Moon in Taurus, in a close conjunction to the triple natal conjunction of Pluto-Moon-Uranus, put the spotlight on the unique, economical-financial, business machine of the city and collapsed it. 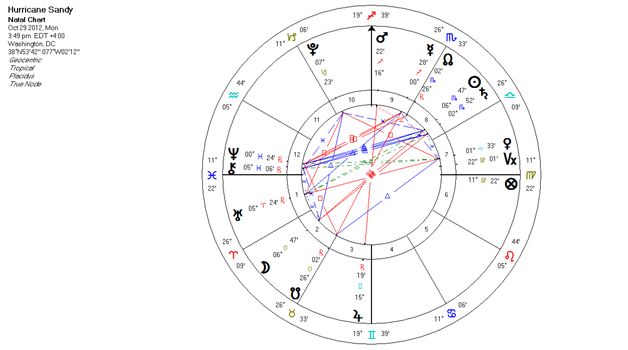 Transiting Saturn-Sun in opposition to the natal triple conjunction added to the calamity of this life-changing event. In addition, transiting Mars making a separating square to natal Sun-Neptune depicts the harsh effect of floods, losses, and broken dreams. However, the transforming power of transiting Pluto forming a favorable Grand-trine to the full Moon, natal Moon-Uranus, and natal Mars, is a sign that Atlantic City will have what it needs to pick up the pieces, recover, and rebuild, provably better than ever. Neptune’s return to Pisces, conjunct natal Venus-Sun-Neptune, opposite natal Mars (2012-17) may bring sorrow and loss, but at the same time, it stimulates the nostalgia and re-activates the dreams. Nothing happens on Earth that the planets don’t show. Hurricanes are propelled by cosmic energies according to planetary configurations and environmental conditions. Cities and people with inherent compatible energies attract those energies. The ignorant-religious tendency to blame God for everything is demoralizing and counter-productive. Environmental deterioration has been ignored long enough thus the glaziers continue to melt, as well as the increase in dire weather conditions. At the present time astrologers don’t have the time or the means to scrutinize and monitor every birth chart. If “global warming” does not destroy Earth first, someday scientists will have special computers programmed to check all the birth charts automatically, around the clock and around the world. Present day astronomy and meteorology are incomplete without astrology. Ironically, the area around the New York harbor first colonized by the Dutch could ultimately live up to its original name of “New Amsterdam.” As the ocean continues to rise, it will be imperative to construct a flood protection system, such as the one in Amsterdam, Holland. Without the sophisticated system of dams, dikes, gates, locks, canals, etc., Amsterdam would be under water. (Manhattan and Atlantic City birth dates - “Horoscopes of the U.S. States & Cities," by Carolyn R. Dodson, AFA Publishers, Inc. 1975).